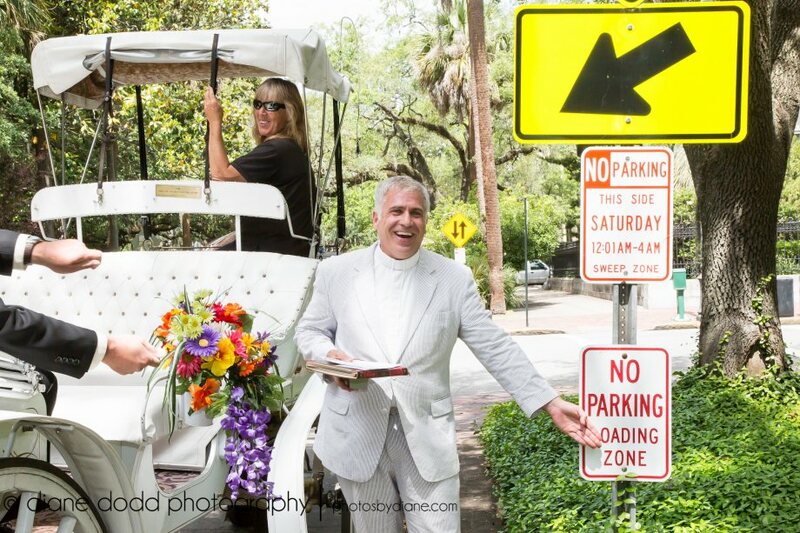 Savannah Wedding: Which officiant is best for us? I wrote this for South Magazine‘s Spring 2010 issue. How to pick the right officiant. First and foremost, if the officiant has advertising and can’t spell the word officiant, then don’t hire them!! It is officiant, not officiate. Officiant is the person. Officiate is the action. Officials are the guys in black and white stripes who officiate the football game I’m watching! Next, there are only two types of wedding officiants in Georgia (all states are not the same): Judges and Clergy. We don’t have Justice of the Peace. If you want a judge, then that’s a simple choice. If you want a clergy, that is not so easy. There are different types of clergy: those whom are rabbis or ministers of a synagogue/congregation, or those who were internet ordained. I make that distinction because those of us who are either rabbis or minister/pastors/clergy of a congregation have had formal education. For example, after college I went and received a 4 year degree from a seminary and became ordained by the larger Lutheran Church. Internet ordained ministers are those who don’t have to graduate from any place (including high school or college) and get their “license” to wed couples online by going to a website and making a couple promises. I don’t even know if they ever go to church. So how do you pick the right officiant? Not all photographers use the same style, not all florists use the same design, and not all clergy have the same approach and personality. Would any photographer do? Would any florist do? What any clergy do? Use the same approach. After all my years experience, this is what I would suggest you consider when finding the right officiant, rather than just settling for any officiant. Are they flexible in the style of ceremony they offer or perform? Will they do a civil/non-religious ceremony? Will they let you create your own ceremony? Do they offer different types of vows? What is their attire? Is it robe, suit and tie, “clergy attire of black with white collar,” or is it shorts and a shirt? When you envisioned your ceremony what did you see the wedding officiant wearing? If your ceremony is formal, is casual for the officiant okay with you? Do you like their personality? Is personality important for you when it comes to the ceremony? If a real awkward situation arises during or just prior to the ceremony, say the rings are dropped, the father of the bride is so nervous he sits down prior to the question, “who gives their blessings for this bride?” how does the officiant handle it? Does the person read the ceremony or do they put some heart into it? Do they add their personality to the ceremony? Are they a rabbi or pastor of a congregation? Does that matter to you? Or are they internet ordained? Not that number of ceremonies count for a lot, but do they have the right experience? Is the clergy a part of the wedding package? If so, can you meet that person ahead of time? If it isn’t a good match, can you find you own officiant? How important is the fee? Are you looking for the least expensive? Most expensive? Can you meet with them ahead of time? Can you talk on the phone to get a feel for the person? Do you want a male or female officiant? Do you want someone who is older or younger? Is the officiant’s “job” just the 10-25 minutes of their talking or performing the ceremony or do they help orchestrate the ceremony, making sure it flows as smoothly as possible? What happens if the officiant gets sick and can’t do the ceremony, are we just stuck without one? Do they find someone (just anybody?) for you? Do they have a backup plan? Is premarital counseling a requirement? What is their experience in the location you choose? Pros and cons? When do you start finding an officiant? One week? One month? Six months? One year? If you wait to long to find an officiant, will you have to settle on whomever you can find? Have they ever forgotten a ceremony? Have they ever said the wrong name in the ceremony? How do they keep that from happening? Do they attend the rehearsal? Should you search for their name on the internet? Let’s say you don’t go to church, yet you want a minister because our families go to church, will they still marry you? 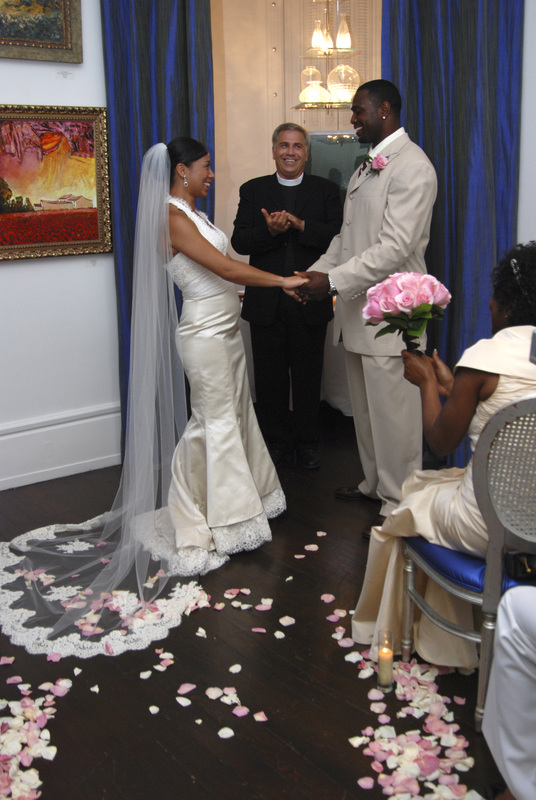 Now that you are completely overwhelmed with selecting the right officiant is for you, what’s next? If you like the person and get good vibes from them, then it is probably a good match, just make sure you have the basics covered.